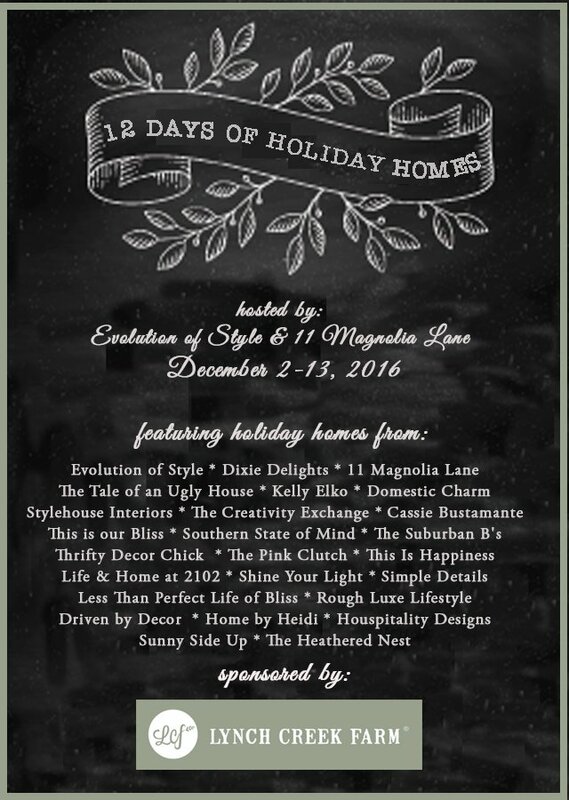 Welcome to day 4 of the 12 Days of Holiday Blogger Home Tour! 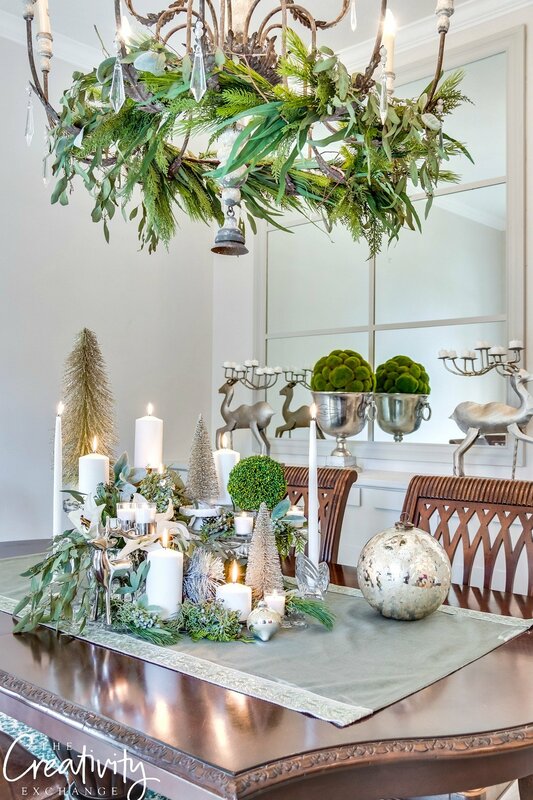 I’m excited to be sharing my Christmas home decor today along with Jen at Stylehouse Interiors and Kelly Elko. A big thank you to Lynch Creek Farm for being a sponsor of the tour this year! You can find the rest of the tour schedule at the end of today’s post. If you’re new to The Creativity Exchange, I’m Cyndy and I’m thrilled you stopped by! We are knee deep in the middle of remodeling several rooms in our home right now and I took some time away from the remodel to decorate for Christmas. Most of the images in today’s post were taken by photographer Linda Beber. I have mixed in a few of my own images as well that I took as I was decorating. Welcome to our home and front porch! 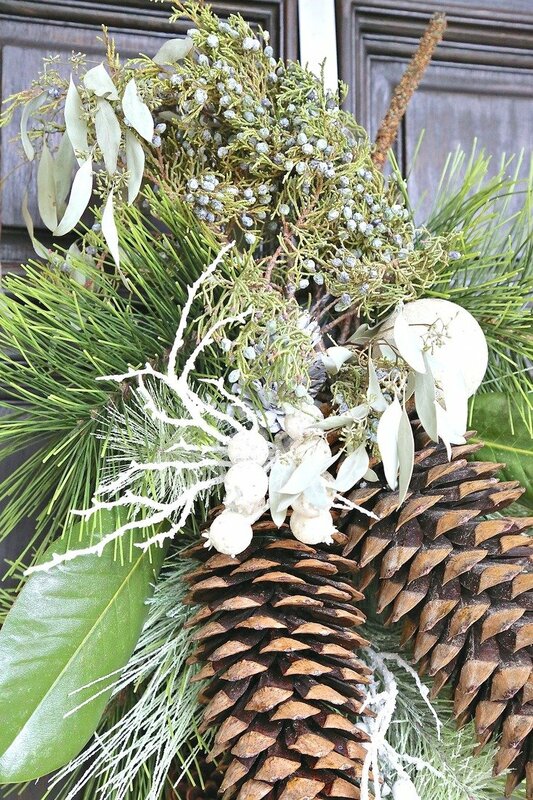 This year, I wanted to incorporate shades of light slate gray blues, greens and these HUGE sugar pinecones (affiliate link). I love working in natural elements and these pinecones always look so pretty. I use them all year round on my porch in a lot of different ways. 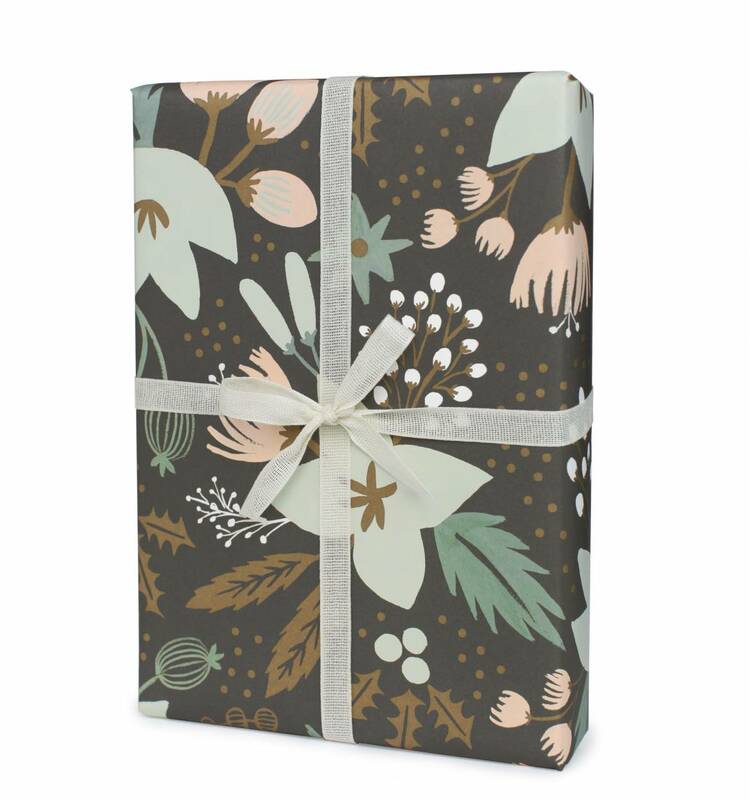 I changed all of our Christmas colors this year because I was so inspired by the colors/design in this beautiful “Winter Wonderland” gift wrap from Rifle Paper Co.
Every year, I always start my decorating by finding my ribbon first that I’ll be working into my garlands and trees. This year, I was so excited to find this beautiful slate blue/green velvet ribbon that was exactly what I was looking for to pull together all my new colors. My door garland is a mix a faux pine and I worked in fresh magnolia leaves and these amazing fresh juniper berries. Yes!! Fresh juniper berries! For the rest of our porch, I’m still decorating but here is what I have done so far. Next up is our foyer as you enter our home. Our girl Ava is here at the door to greet you! Ava is full of Christmas cheer all year round! 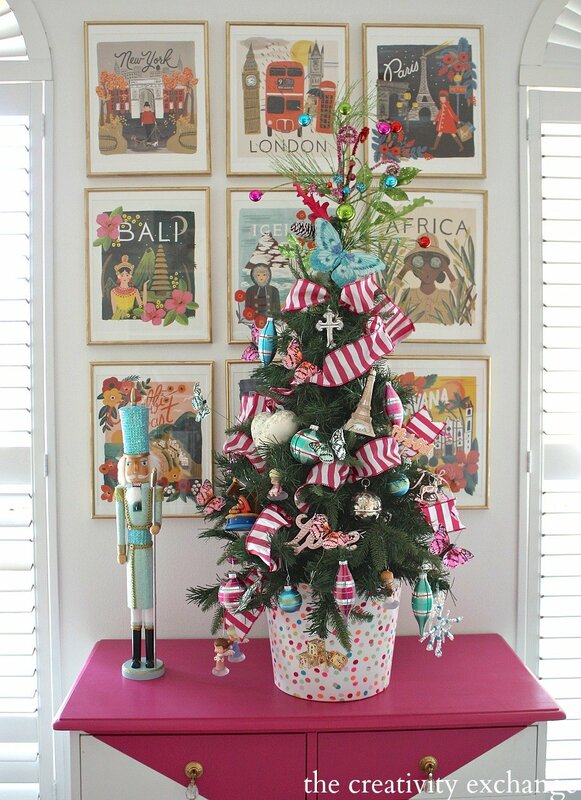 On my foyer/entryway table I decorated a tree in a champagne bucket. I worked in the fresh juniper berries, faux pears, fresh eucalyptus and that pretty slate blue/green velvet ribbon. 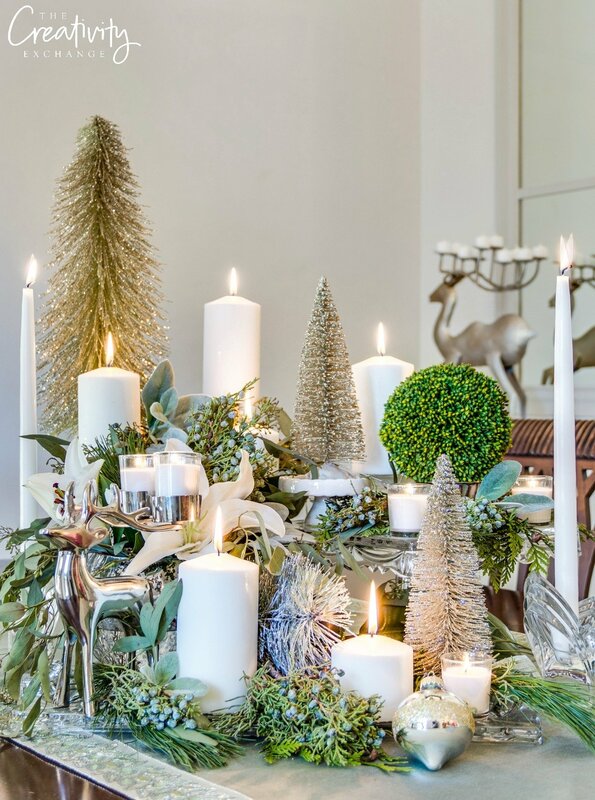 In our dining room this year, I created a winter greenery wonderland table by layering cake stands, candles, fresh greenery, more juniper berries and brush trees. Layering cake stands is such an easy way to create a festive centerpiece. Use what you have like turned over nut bowls and other pieces to elevate candles at different heights. 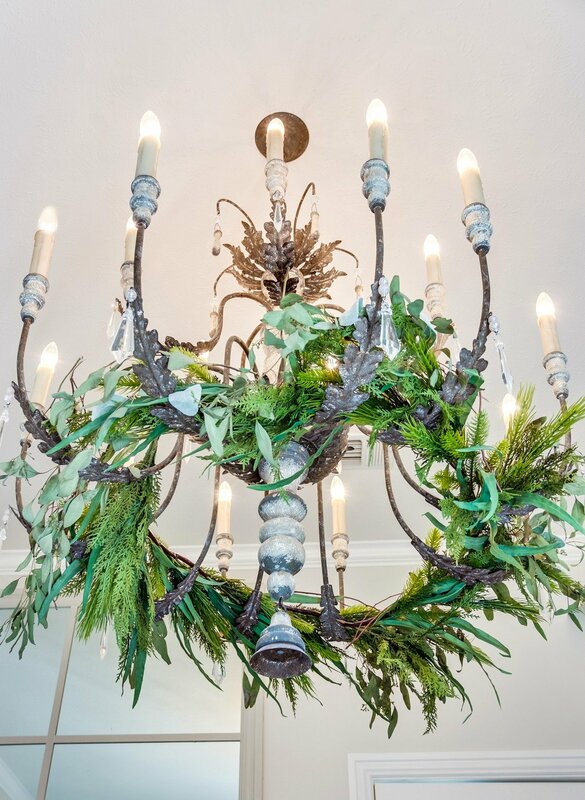 I also layered a mix of faux cedar garland with fresh eucalyptus into our chandelier. 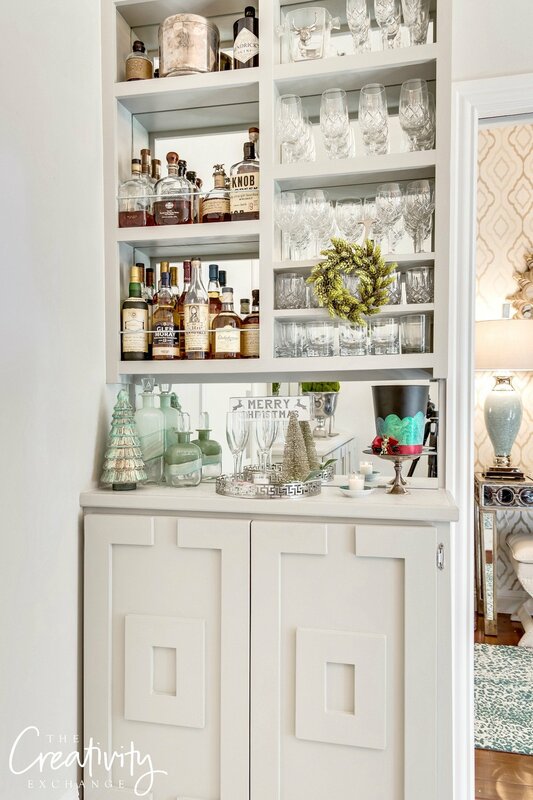 A couple years ago, we built this narrow bar in a wasted corner and we will put it to good use this Christmas! Our living room is one of the rooms we are in the process of remodeling. 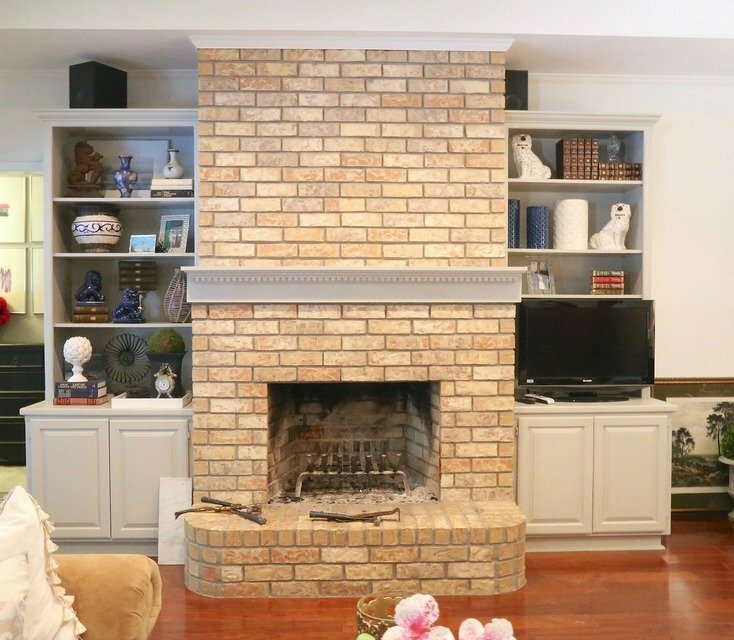 We recently just finished enclosing our brick fireplace and painted all the bookshelves white. We are not finished with the space yet (we’re also switching out rug/furniture) but here is the before and after so far. We are so excited with the big change! The brick fireplace always bothered me because it really overpowered the space. I felt like this was the best solution and now we can’t wait to get the rest of the room finished and add a new rug/furniture to better compliment the lighter colors. I’ll be sharing all the details of this room transformation/enclosing the brick in the next couple of weeks when the room is finally finished. 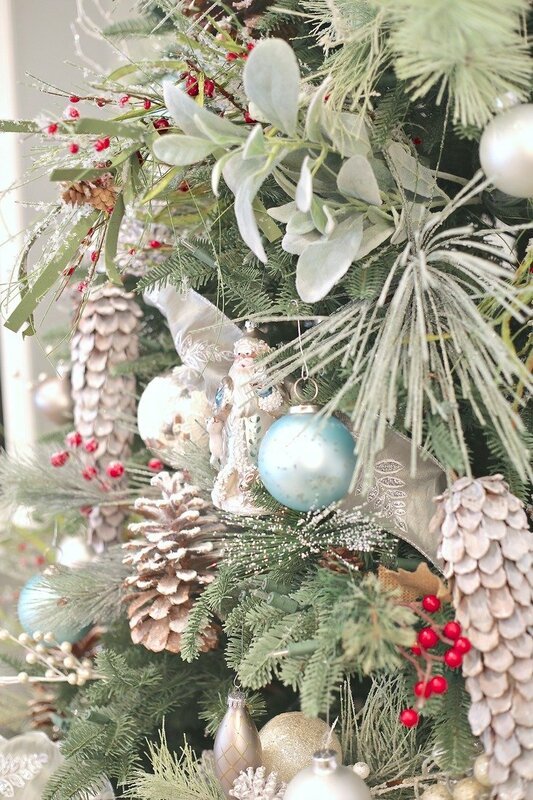 On our main tree this year, we layered our tree with fresh eucalyptus, magnolia leaves and LOTS of flocked sprigs. I really wanted it to feel natural and layered woodlands. The beautiful garland on the fireplace came from Lynch Creek Farm. It’s a mixed garland with red and incense cedar and it’s absolutely gorgeous. I added juniper berries and eucalyptus at the corners. Lastly, we always do a tree in my daughter’s room and we’re still in the process of finishing it but she’s requested the same tree decor from the last two years. By the way, we framed a Rifle Paper Co. calendar for her wall and it’s such a fun project that you can see here. So here’s a pic from two years ago to show you what we’re doing. I’ll switch out shots here when it’s finished. Well that’s it for now! I still have more decorating projects I’m finishing up and I’ll add them here as we get them done in the next day or two. For any of you interested in how I work the ribbon into my trees, I shared all my tricks/tips from my department store visual design days here that make Christmas decorating so much easier! Cyndy Aldred of The Creativity Exchange is a participant in the Amazon Services LLC Associates Program, an affiliate advertising program designed to provide a means for sites to earn advertising fees by advertising and linking to amazon.comCheers! It’s all just stunning, Cyndy! 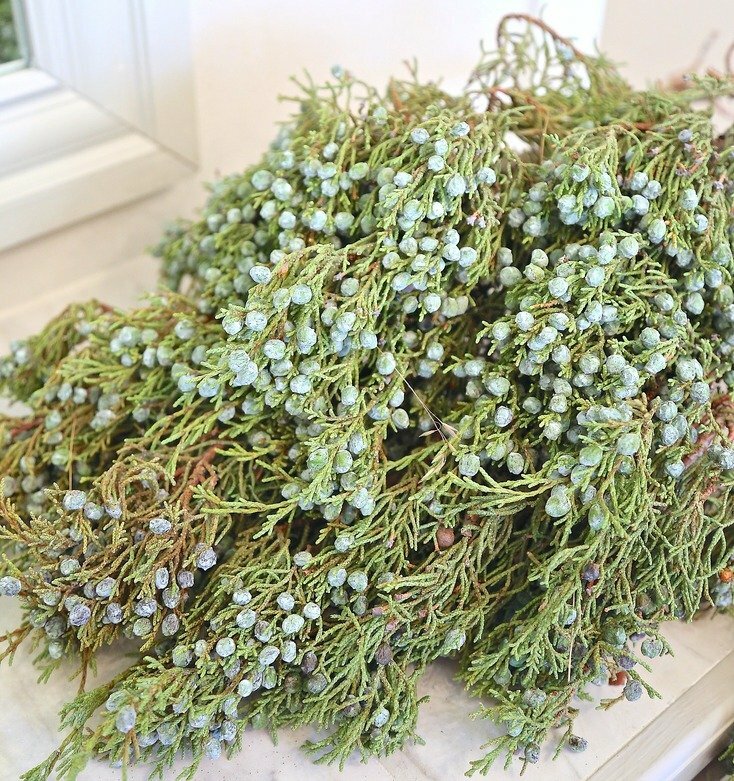 I’m with you–fresh juniper berries are a great score when it comes to holiday decorating! It’s hard to pick a favorite room, but I’m loving your dining room, and your daughter’s precious butterfly tree in front of the Rifle Paper calendar. LOVE! Thanks so much, Merry Christmas!! Everything is just beautiful! Love the soft colors you chose & natural elements. And Ava… well, she’s always a beauty!! cyndy, your home looks amazing! that tree with the magnolia and eucalyptus is just genius! and your dog… oh my gosh! I love what you did with the fireplace. My fireplace looks very similar to your old fireplace. Can you tell me what the process was for the make over of your new fireplace. It is just lovely. So is the rest of your home. I love your outside decor. I love all the natural elements. I love what you did with the fireplace. My fireplace looks just like your old one. What was the process for this makeover. Your home is lovely. Love all the natural elements. Wow, your home is so beautifully decorated for the holidays. You should be very proud. P.S. That painting over your fireplace is gorgeous. To say that your entire home is majestic this time of year would be an understatement Cyndy! It is stunningly gorgeous!!!! 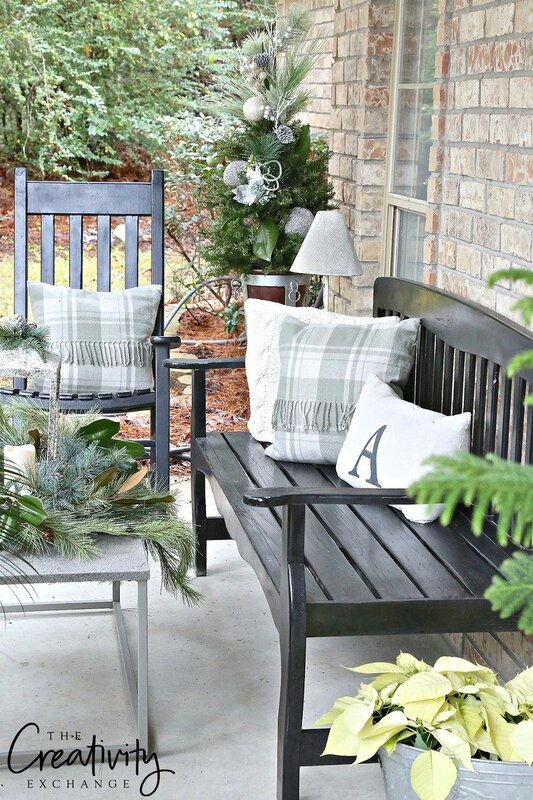 Love your front porch and how you added fresh to faux, perfection! I love every nook and cranny of your home and your magnificent tree! Yes, I’m a huge Anna Rifle fan too and just bought the calendars from this year (on sale of course), thinking of the exact same thing you did for your daughter’s room! Love her work! So very honored to share this home tour with you! Cheers! Thank you so very much for such kind words Vel! Your note made my morning! Thank you! Love that your a Rifle Paper Co. fan too! Everything they do just inspires me so much! Thank you for stopping by and leaving me such a wonderful note! Cheers! Everything is absolutely beautiful. Love your colors! 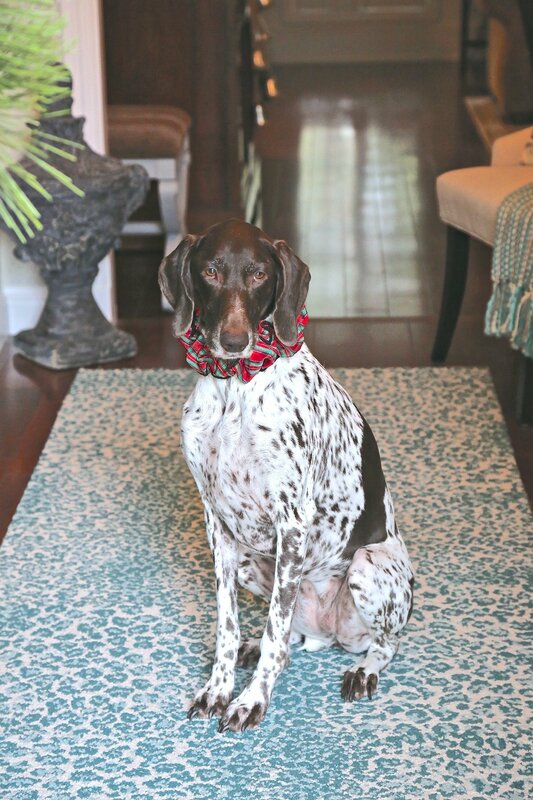 What company is the blue leopard print rug runner from. The dog is adorable too. Oh my goodness! You knocked it out of the park, girl! 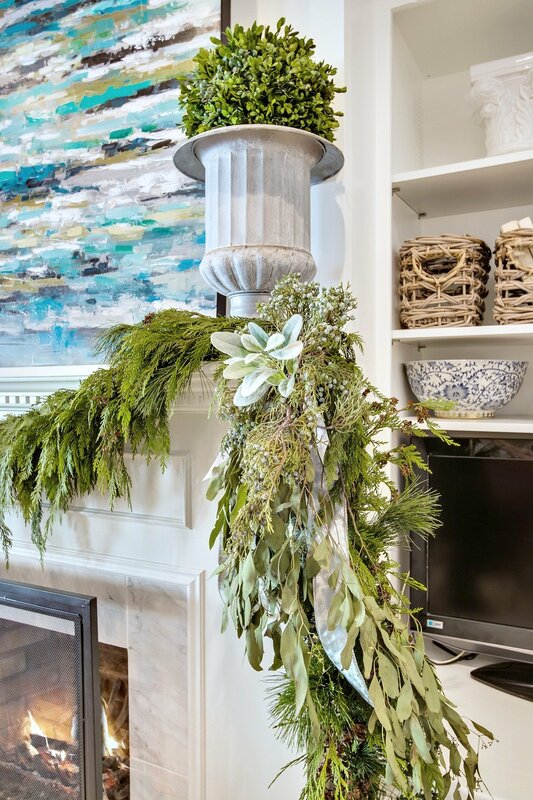 I love all of the greenery that you incorporated in such a classic way, and your fireplace looks SPECTACULAR! Thanks so much for joining in – so stunning. Thanks girl and thank you so much for including me! I didn’t think I would be able to swing more than one room this year with the big remodel but I somehow got motivated! Ha! Big hug friend! Cyndy it’s stunning! I don’t know where to start! I am so jealous of that velvet ribbon, I wanted to find some to use in my decor this year but couldn’t find the shade I wanted. 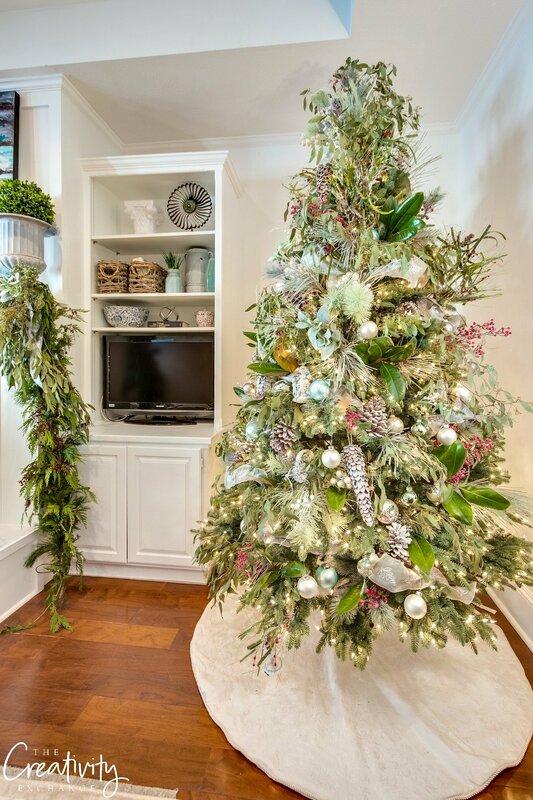 I love your tree in the entry and your main tree as well, I have always loved woodland trees and yours with the mix of pastels and vintage ornaments makes my heart beat faster! Love Love Love! Truly the most beautiful Christmas decorating festival! Could you share the paint color on the wall of your foyer? Cyndy, everything is just gorgeous! 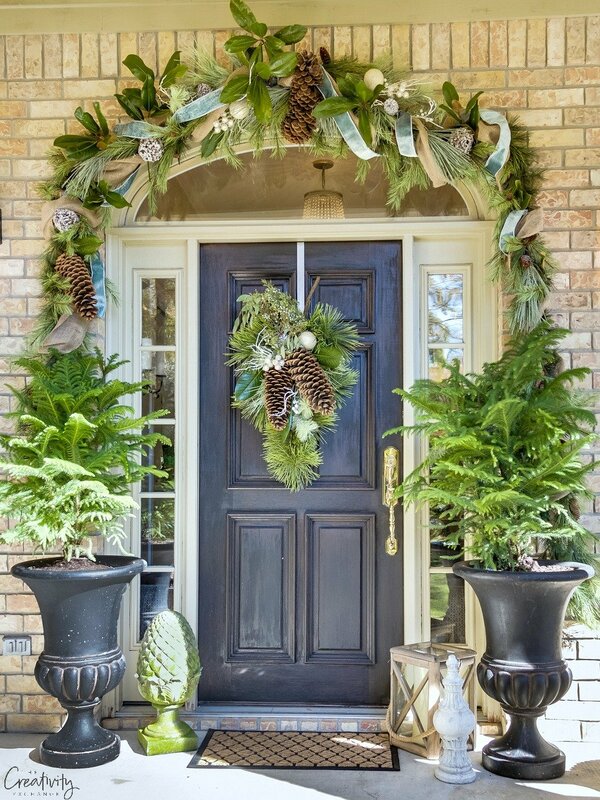 That garland around the front door is stunning! I love the fresh yet muted tone. Beautiful home my friend. Wow Cyndy your home is stunning! 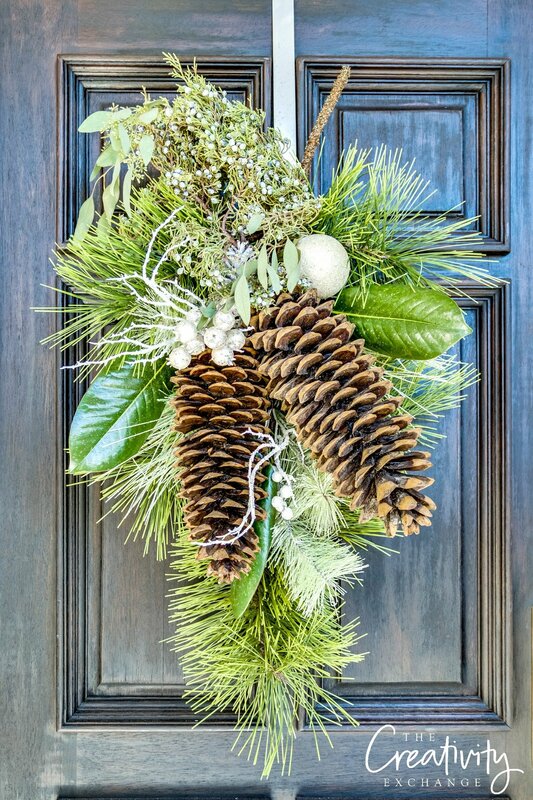 I LOVE the huge pinecones and the fresh juniper berries – I’ll bet it smells heavenly! My dog Sushi wants a playdate with Ava! Your home is beautiful. So jealous! 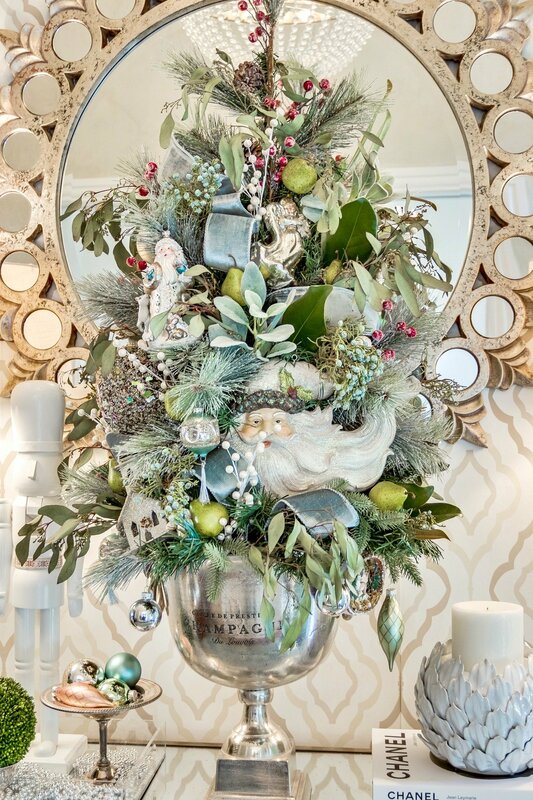 Cyndy, can you share your process of how you place the tabletop trees in the unique containers (champagne bucket and your daughter’s tree)? My tabletop trees all have an ugly stands that desperately need to be hidden! Thanks and your home is beautiful. Thank you Nancy! The trick is to buy the small trees that have a planter type container as a base and not those four leg things that stick out. 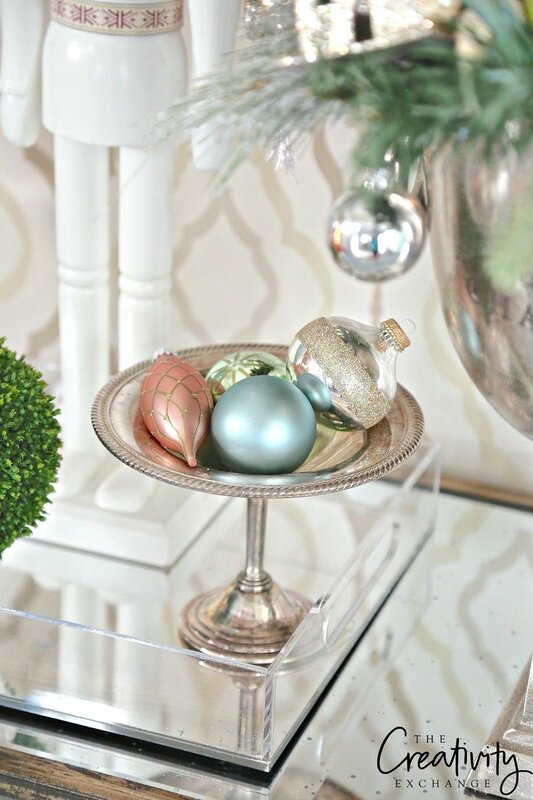 Hobby Lobby’s small trees are in gold planters that easily slip into urns/buckets, etc.. I then cover the base with a bunch of palm size rocks (from my garden) to secure it. I hope that helps and thanks so much for stopping by! I saw the room you posted on Instagram and that inspired me to visit your blog again today. That room definitely hinted at all the goodness here! 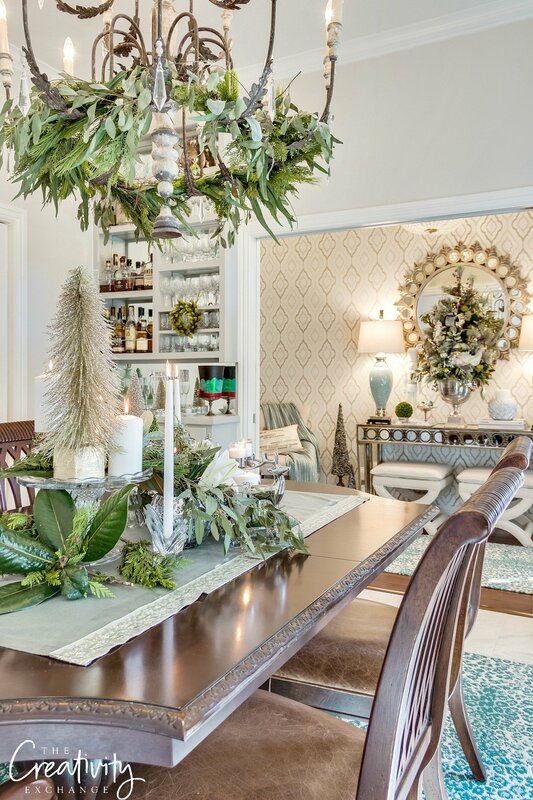 I love the juniper berries and how they coordinated with your decor scheme for Christmas. Thanks for all the inspiration! I love this Cyndy! Everything looks so calm and peaceful. 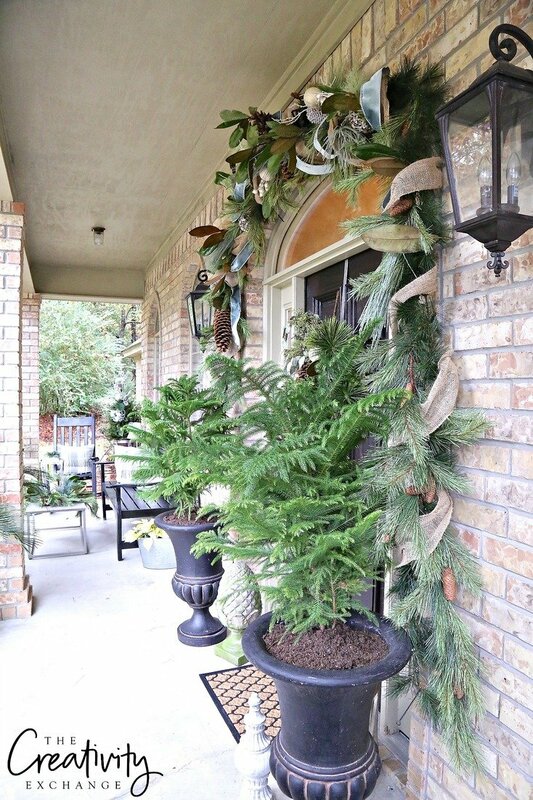 Can you share how you hung your garland around the front door? My door is rounded at the top and I’d love to hang something around it. Thanks for sharing your home! I love the framed calendar prints in your daughter’s room. Are the frames custom made and, if not, where did you purchase them? I purchased them in shiny chrome and spray painted them all gold, using Rustoleum. Thanks for stopping by! What size are the frames? Cyndy, Gorgeous holiday decor. I love your light palette with the touches of gold and blue. 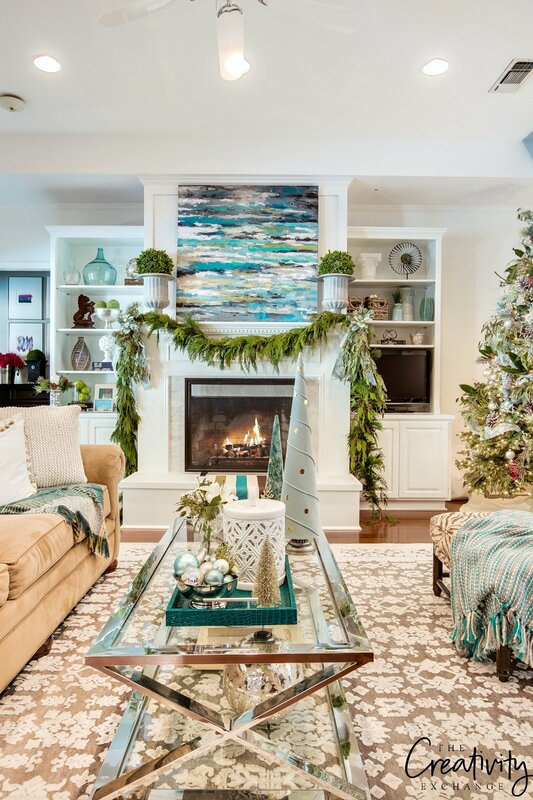 Your Christmas decorations fit beautifully with your home’s regular color scheme. Thank you for sharing. Amazing Cyndy! 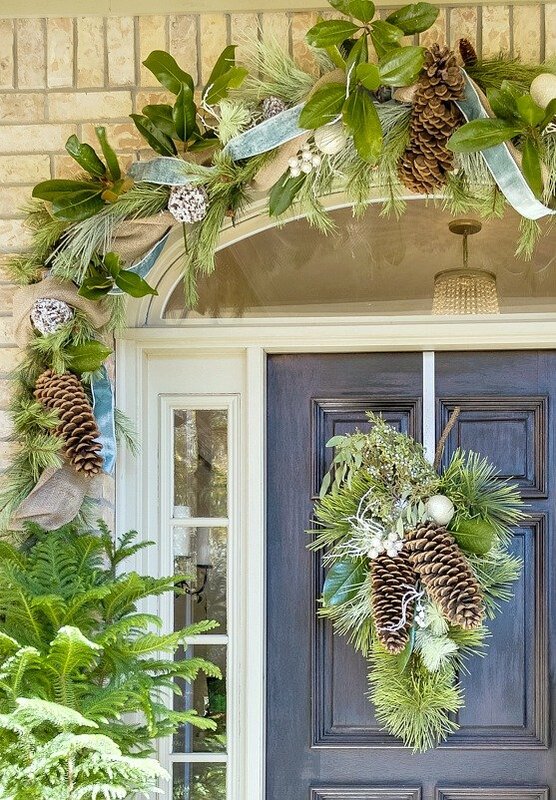 Your front porch is my favorite with that stunning garland and those huge pinecones! Love the color scheme that was inspired by that gorgeous paper! Everything is beautiful. Merry Christmas! where did you get your ribbon, I love that velvety color? 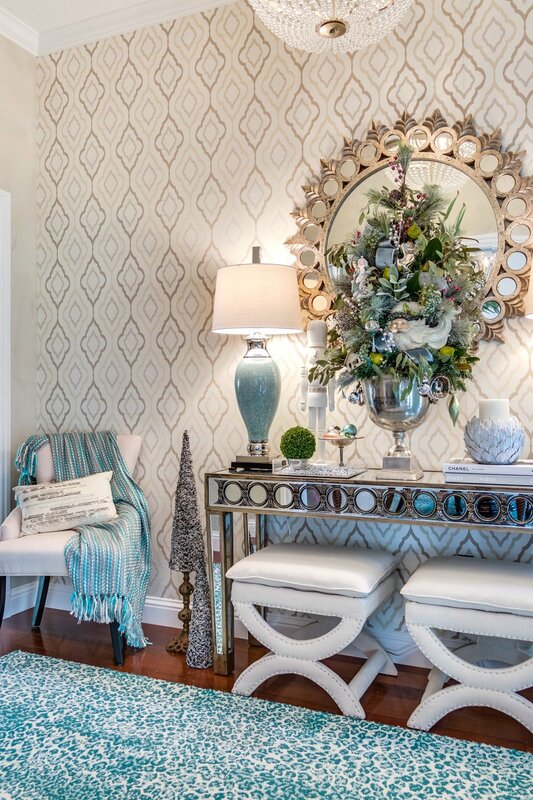 I absolutely love your entryway, and want to redo mine with that exact wallpaper. Would you tell me where you purchased it?? I love the mirrored table as well. Just gorgeous! It’s all absolutely amazing! I LOVE that tree in your entry. I’m pinning that for later!! 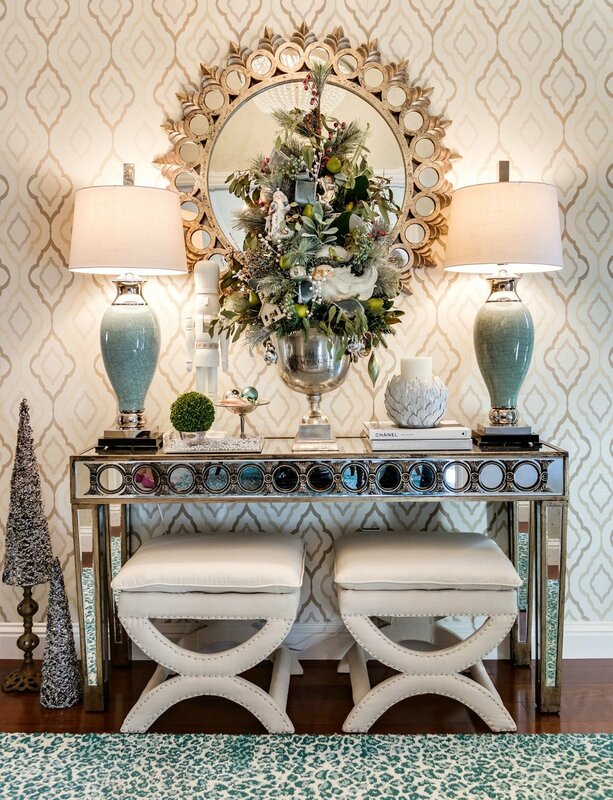 Cyndy, I have been a huge fan of your decor for YEARS! I am so excited to be participating in this home tour with you! Your family room transformation is fantastic. And I love your daughter’s colorful tree and the framed calendar artwork. Happy Holidays! What a lovely color combination. The swag on your door is breathtaking. Juniper berries are wonderful aren’t they? 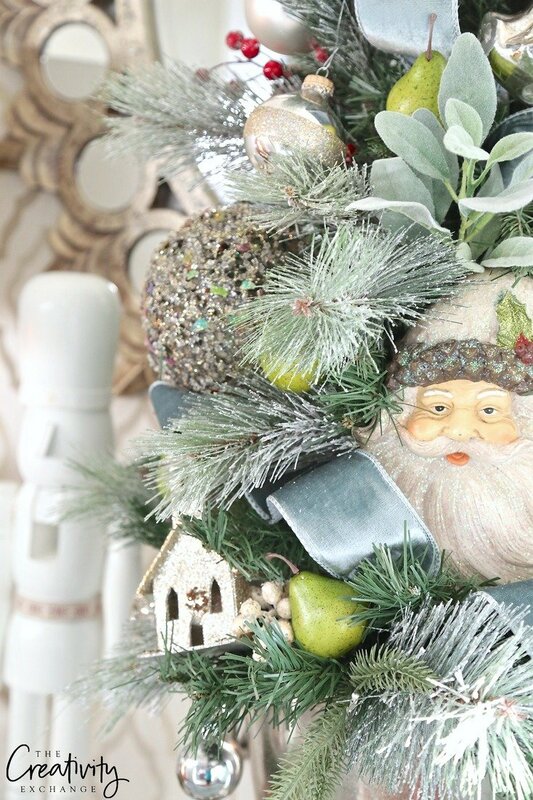 Lovely garland from Lynch Creek and your tree is simply gorgeous!! Oh my goodness!! 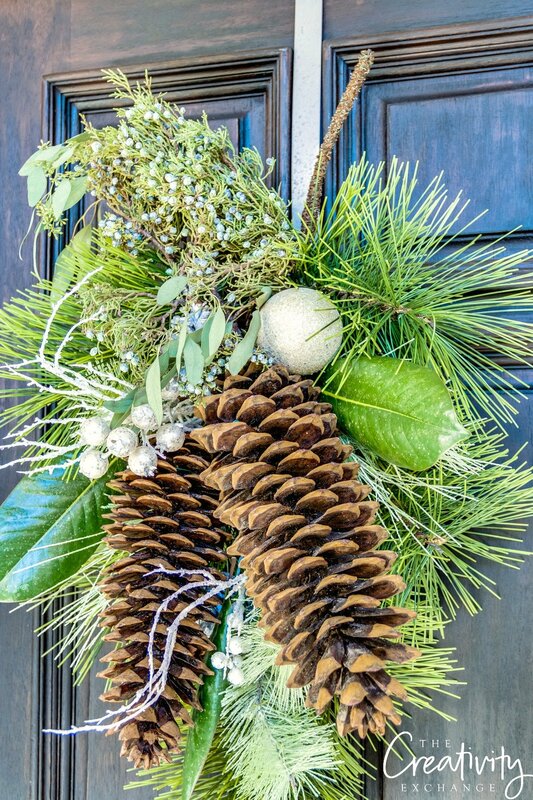 That swag wreath is gorgeous on your door! What a stunning tour! I love the new fresh white look in your living room and your bar area is so classy and such a great use of space!! It is all so so pretty!! Everything is beautiful. What brand is your dining room table and chairs? I really like them. Thank you so much! My dining room table and chairs are made by Bernhardt Furniture. Not sure if they still make it or not though. We bought the set about 10 years ago. Thanks for stopping by! Exquisite tour!…I feel as if I am reading this from an elegant magazine. 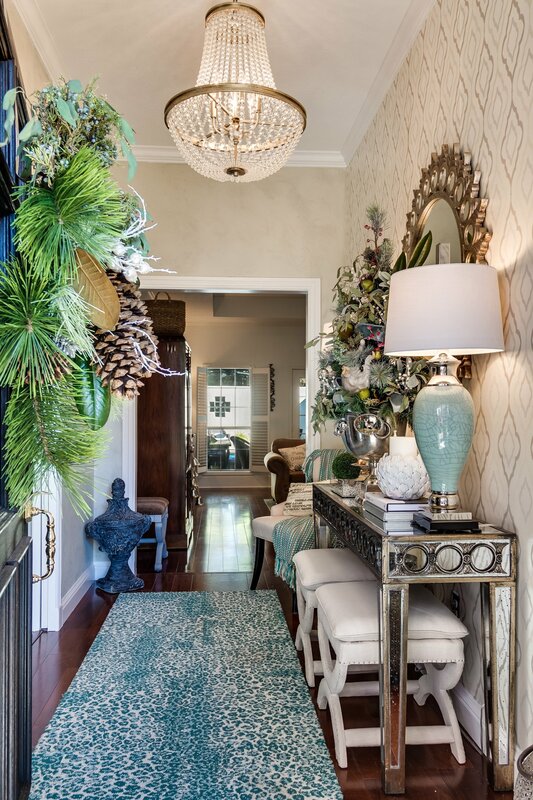 Love the stunning details in your home accessorized with the beauty of fresh greens. Merry Christmas Cyndy to you and your family! Oh goodness me! I am drooling over all the details in each and every photos. Your colors are so refreshing and clean! Just love your Christmas decor. Also, your front door color is amazing as well. Job well done. I’m in awe. I thought nothing could top Ava, then I kept scrolling, and it is ALL exquisite! The stocked bar was kind of a highlight too 😉 The fireplace makeover is FANTASTIC!!! Have a wonderful holiday season!! Just beautiful. Love all the soft colors you used. Breathe taking….